On this date in 1935 Benito Mus­so­lini’s Italy in­vaded the north­east African King­dom of Abys­sinia (present-day Ethi­o­pia) without a declara­tion of war, and for doing so the League of Nations in­structed its mem­ber states to im­pose limited econo­mic sanc­tions on Italy. (Neither the U.S. nor Ger­many were mem­bers of the inter­na­tional body.) The next year, after Ital­ian forces had van­quished Empe­ror Haile Selas­sie’s feu­dal state using modern Euro­pean wea­ponry, including air­planes, tanks, heavy artil­lery, machine guns, and poi­son gas, Mus­so­lini crowed to an audi­ence in Rome on May 9, 1936, the day Ethio­pia was for­mally an­nexed, that “Italy has at last her Empire—a Fas­cist Em­pire.” (Fas­cist East Africa con­sisted of Ethi­o­pia, Eri­trea, and Ital­ian Somali­land.) Years earlier, in 1925, Mus­so­lini had stated: “I want to make Italy great, respected, and feared” through­out Europe and the rest of the world. His words harkened back to the past glory of the Roman Empire, with its impe­rial reach through­out the ancient Medi­ter­ranean basin (Mare Nos­trum, Latin for “Our Sea”) and deep into Africa. But over­whelming ill-prepared and badly equipped Afri­can armies was a long way from Mus­so­lini’s vision of pro­jecting Ital­ian supre­macy among her modern-day Medi­ter­ranean neigh­bors, and for that he needed a strong ally. 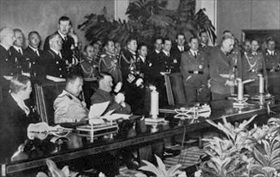 In 1936 Musso­lini made his first refer­ence to a “Rome-Berlin axis” in a speech in Milan, for­malizing it in a treaty of friend­ship his nation signed with Adolf Hitler’s Ger­many on Octo­ber 25 of that year. The two dicta­tors with their shared “ideo­logical affin­i­ties,” a phrase used by both National So­cial­ists and Fas­cists in offi­cial and un­offi­cial com­mu­ni­cations, had met for the first time in June 1934 in Venice, Italy. The 1936 “Treaty of Friend­ship” recog­nized each coun­try’s spheres of in­ter­est: Ger­many’s north of the Alps, where the nations of Aus­tria, Czecho­slo­va­kia, and Poland lay, and Italy’s to the south, where Al­ba­nia, Greece, and North Africa lay. 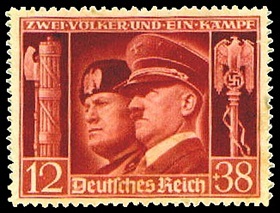 To com­mem­o­rate the pact, Ger­many issued a post­age stamp depicting the two dic­ta­tors standing shoulder to shoulder, at the top of which was written: “Zwei Voelker und Ein Kampf” (Two Peoples and One Struggle). 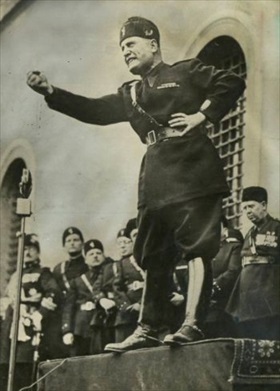 Left: Mussolini at a National Fascist Party rally. 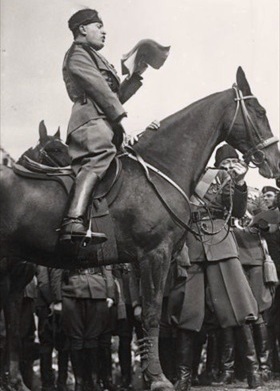 During the 1920s and 1930s, Nazi Party leader Hitler fre­quently paid homage to Fas­cism and its supreme party leader Musso­lini (Il Duce, meaning “the leader”). Both dicta­tors used the poli­tical par­ties they founded to seize and con­soli­date their power at the national level, Hitler more bru­tally than Musso­lini. Musso­lini ruled Italy con­sti­tu­tionally from 1922 to 1925, when he dropped all pre­tense of demo­cracy and set up a dic­ta­tor­ship that ruled the coun­try until he was toppled from power by his own Fas­cist Party in July 1943. Hitler was appointed by Presi­dent Paul von Hinden­burg Ger­man chan­cel­lor in 1933 and soli­dified his dic­ta­tor­ship after Hindenburg’s death in 1934. Right: As heir to the Roman Caesar, Musso­lini fre­quently used props, mili­tary uni­forms, and settings that evoked power and pres­tige. In this photo from 1929 he is seen ad­dressing an audi­ence in Northern Italy mounted on horse­back. On another occa­sion he addressed Ital­ian troops from the top of a tank, arms akimbo. Right: The term “axis” was first used by Musso­lini in Novem­ber 1936 when he spoke of a Rome-Ber­lin axis arising out of the Ital­ian-Ger­man Treaty of Friend­ship of Octo­ber 1936. Later, in May 1939, this relation­ship morphed into a mili­tary and eco­no­mic alli­ance, which Musso­lini referred to as the “Pact of Steel.” The term “Axis powers” for­mally came into being after the Tripar­tite Pact was signed by Italy, Ger­many, and Japan in a gala cere­mony (shown here) on Septem­ber 27, 1940, in Berlin, Ger­many. Member­ship in the pact expanded later that year and the next with the addi­tion of Hun­gary, Romania, Slovakia, and Bulgaria.